Schedule the Process: Scheduling the process consists of a sequence of steps which add value to the system or product. From the Requirements Definition of the product, through the design process to the final drawings for that product and then through the Assembly, Integration, test and shipping of that product to the next higher level of assembly. Through the use of vertical integration techniques; the same principles apply to the design phase as well as the production phase. 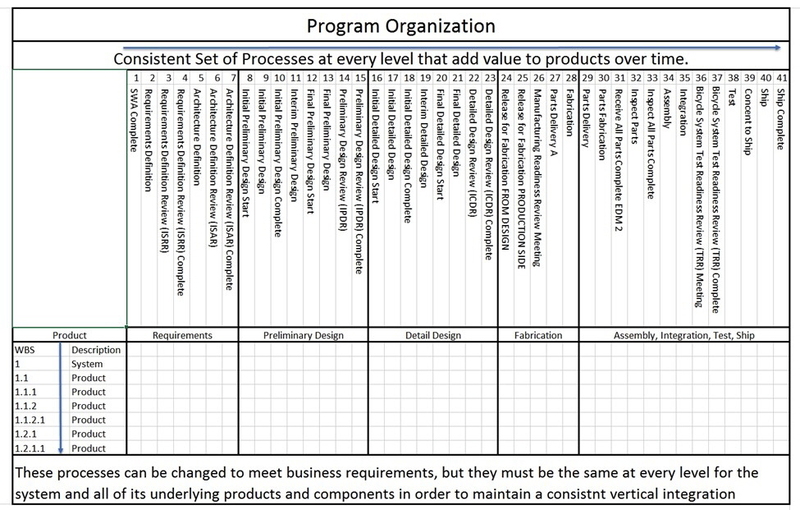 Structnet's "Structured Scheduling" has a foundation of 41 processes & milestones for every product in the schedule. These processes can be changed to meet the business requirements of your company. Yet they must be the same at every level of the system and all of it's underlying products and components in order to maintain a consistent vertical integration.